Having had my trip to Oswestry and the Welsh borders cut short due to Crosby going lame I have spent a few weeks at home. My early return has meant I have been able to crack on with some decorating and we can push forward with the next stage of the refurbishment of our home. However, it has meant I have been restricted in my walking and it is a few weeks since I last had a good stretch of the legs. Lynnie has suggested we combine a trip to visit her brother’s family in Upton with me heading out for a walk on the Purbeck Hills. Leaving the dogs in the care of our neighbours we head to Dorset and after a cup of tea with Lynnie’s family I am back in the car, this time accompanied by my nephew Luke. He is a keen walker and is joining me for an afternoon jamabout. 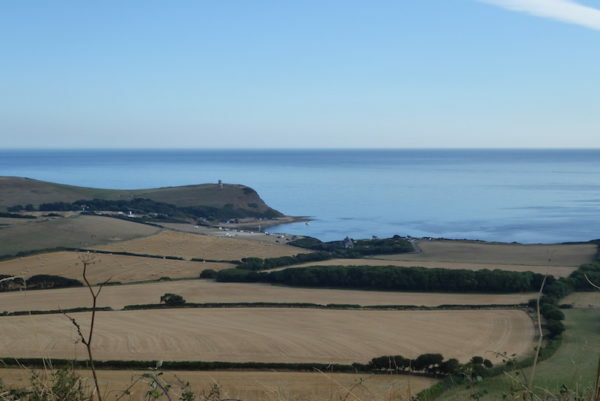 I know the walk I am keen to do, it is a route familiar to Luke so with his local knowledge we avoid the customary seasonal traffic and are soon at the small car par park in a disused quarry above Kimmeridge. Leaving the car park we turn right along the road and then very quickly right at a junction and then equally quickly right again to join a footpath heading up a track. It is a warm afternoon and this is a steady ascent to start the walk. I have not walked with Luke since he was a nipper, now in his thirties he is a strong fit chap and sets a pace that has an old codger like me huffing a bit, so I am relieved when we reach a gate and I have a chance to ask him some questions about the view. As Arthur Daley would say, this is Luke’s “Manor” he works, walks and fishes around here so knows it like the back of his hand. 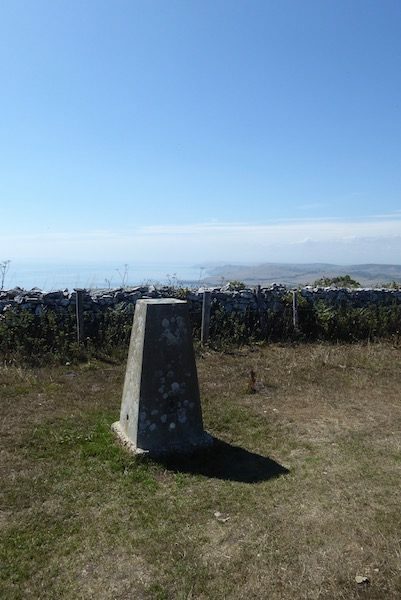 After admiring Kimmeridge Bay we go through the gate and proceed at a steady pace along the footpath close to the fence to reach the trig point at Swyre Head. 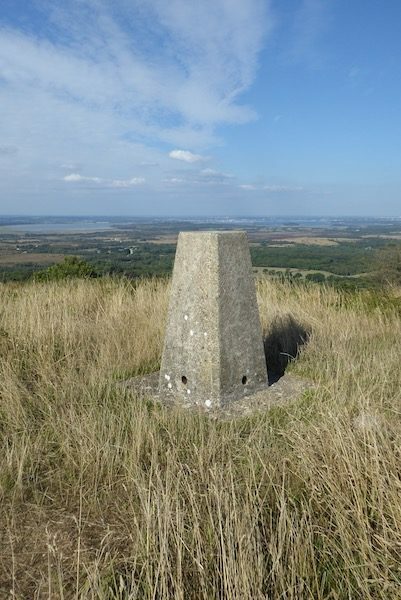 Although I have visited this trig previously I had not kept photographic evidence so had not recorded it as “bagged”, therefore it is now the eighty-second I have “bagged”. Since setting off we have been following the route of the Hardy Way. 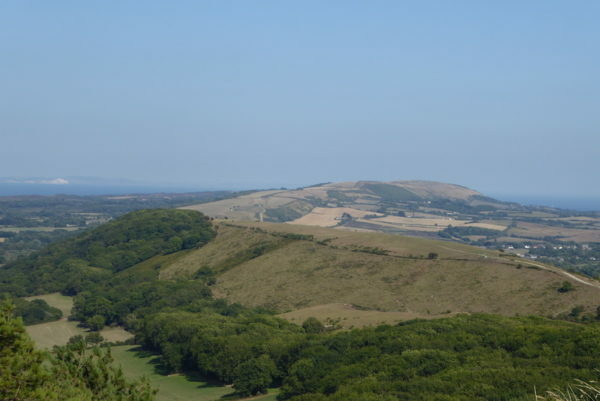 This 220-mile route starts in Dorchester and heads through Dorset and South Wiltshire, referred by some as Hardy Country after the author Thomas Hardy. 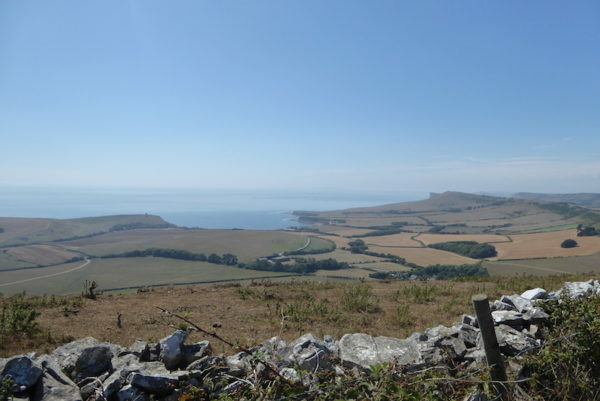 The route was devised by a Dorset rambler, Margaret Marande and visits many of the sites of Hardy’s life and novels. 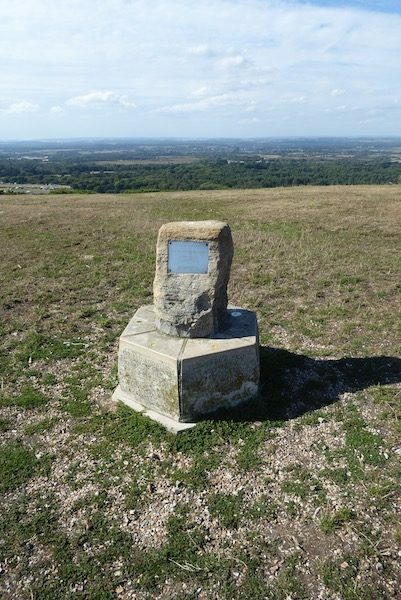 Following the way-markers in a northeasterly direction towards Kingston we soon reach a solid stone bench erected in memory of those who lost their lives in two air crashes nearby. The first crash on 18th March 1938 was a young pilot from the Torpedo Training Unit. Flying a RAF Swordfish Mk 1 towards Plymouth he flew low over the Purbecks to avoid low cloud and clipped the top of trees in nearby Polar Wood. He and his two passengers, along for the ride, lost their lives. The second accident on 15th June 1945 was the crash of an RAF Liberator MK IX. It had taken off from RAF Holmsley South in the New Forest and was heading for Palam, India with a refueling stop in RAF Castel Benito, near Tripoli. After heading out over the coast the pilot reported loss of fuel pressure and turned to return to base. Again low cloud was the problem and the plane crashed into the hill above Encombe House, near what is now the coastal path. Wreckage was spread over a wide area with one wing ending up near the footpath in Polar Wood. All twenty-seven men on board lost their lives. On reaching a minor road we turn right and head towards Kingston, just as we enter the village we take a path on the left and follow this to Blashenwell Farm. Where we walk through the farmyard, with it’s traditional farm buildings awaiting re-development and rusty old water wheel. 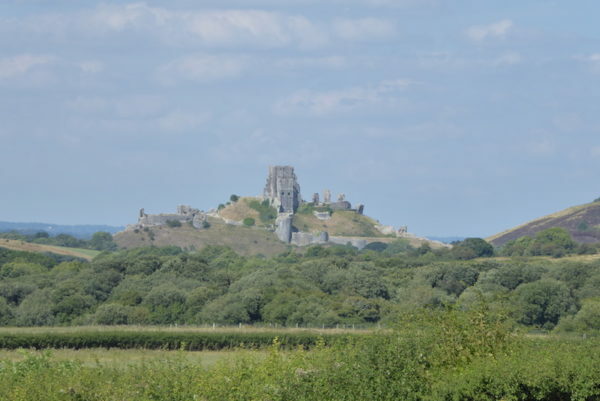 Following the farm drive we head towards Corfe Common and have a splendid view over the Castle. 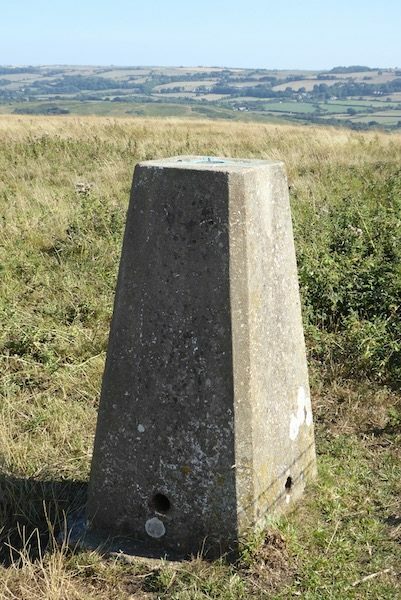 Walking into Corfe we take the path that runs by a stream and goes beneath the Castle and then take a path under West Hill, when the footpath forks we go right heading uphill and then take a slight diversion to visit the trig point on the ridge. Number eighty-three bagged. 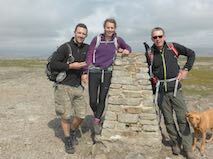 Continuing along the ridge we chat about out trig bagging. If I had started recording trigs when I was Luke’s age I would have a few hundred logged by now. But hopefully I will have the opportunity to collect many more in the future. The views in all directions from Knowle Hill are really outstanding, we can see for miles in every direction. 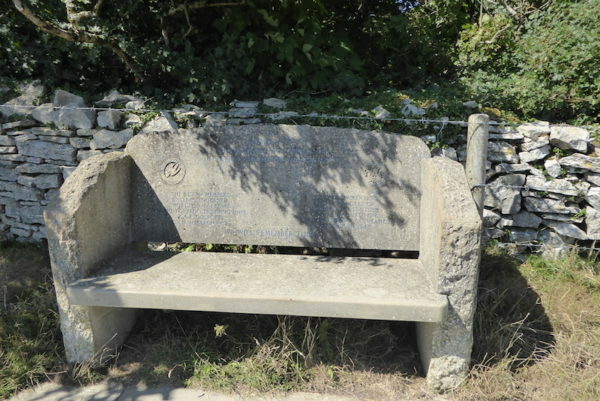 We reach a junction of six footpaths on the ridge; here there is a memorial to Mary Baxter MBE (1919-88) the inscriptions states she helped to conserve the Dorset Countryside and the protection of its footpaths. It is poignant reminder that access to our countryside should never be taken for granted, it is incumbent on all those who love “getting outdoors” to ensure that access for future generations is retained. We continue along the ridge then drop down to a minor road and follow it for a short while before taking a path that goes straight on along Ridgeway Hill. 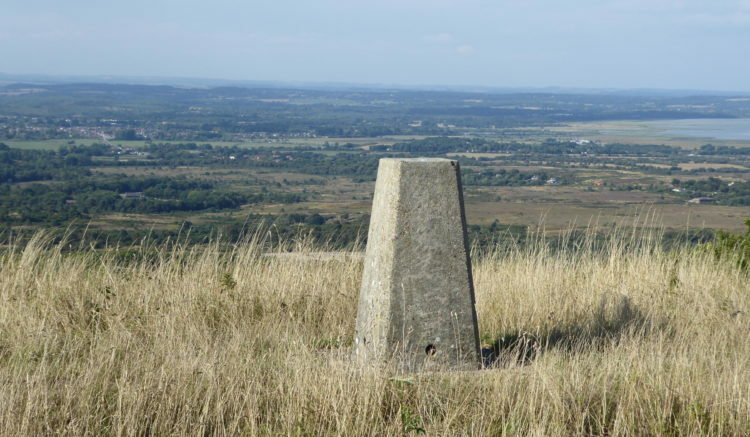 At a crossing of paths we turn right and follow a path leading down to a road, which we cross and then head uphill on a well-worn path through the bracken to reach the summit of Creech Barrow Hill where we reach our third trig point of the day and the eighty-fourth I have bagged. The views back along the ridge are really stunning. Then we look over Poole Harbour and Luke identifies various points of interest below us. After retracing our steps back down the hill and back up to Ridgeway Hill we turn right to continue walking along the ridge to arrive at Grange Arch. 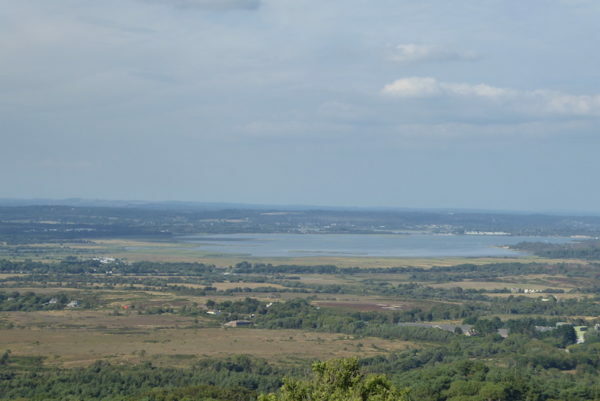 It is about thirty-seven years since I was here, it was soon after Lynnie and I were together and she wanted to take me for a walk on the Purbecks. 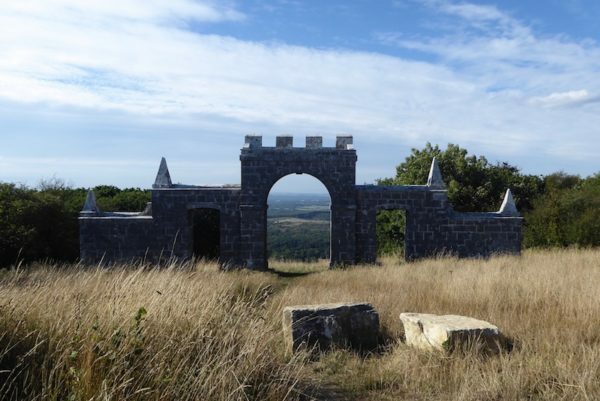 Grange Arch, also know as Creech Folly, was built n 1746 by the then owner of Creech Grange, Dennis Bond. It is a stunning structure that serves no purpose other than framing cracking views. 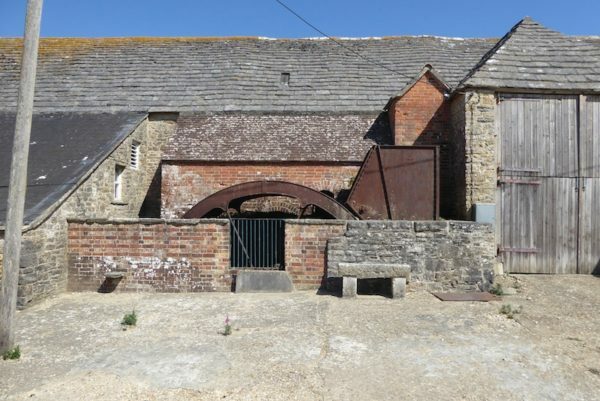 It is now owned and maintained by the National Trust. Nearing a minor road we take a footpath on the left heading steadily down Grange Hill to join a minor road. Turning left we follow the road to the entrance to Steeple Leaze Farm camping site, here we take the footpath along the farm drive. After passing farm buildings we cross a stream and then as the path forks keep to the left to go uphill on a narrow path to reach a field which we cross. At a junction of paths we turn left to follow the path along the edge of an arable field, this path runs along the ridge above Kimmeridge benefitting from great views over the bay. Reaching a minor road we are back at our starting point with the car park opposite us. Our walk on this cracking afternoon has covered just over eleven miles and the views have been outstanding. 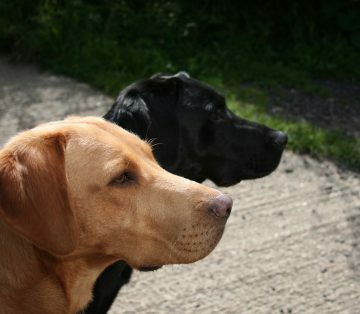 I have really enjoyed having Luke’s company for the afternoon and hope we can repeat it again before too long.